It is going entirely too far to say that there is a special place in hell reserved for those who get a person’s hopes up only to dash them for a few giggles. Let that be noted. But still, what the hell, man? That’s the collective response of The Takeout staff to this story from Fresno’s ABC 30, which reports that some impish troublemakers in Porterville, California decided it would be fun to hang a sign that says “In-N-Out Burger Here Soon” on a construction site, when no such future In-N-Out exists. This is absolutely not a big deal, we admit. But we have issues. 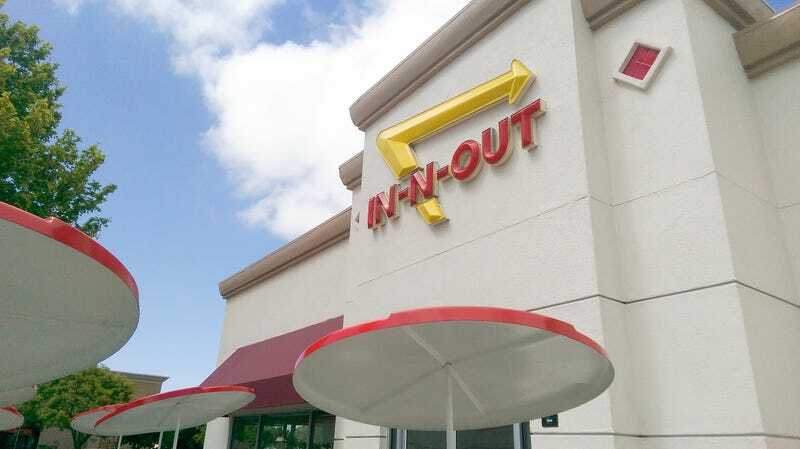 First, there are In-N-Outs in California. It is known. According to Google Maps, the location closest to Porterville is in Visalia, some 30-odd miles away. This means the only people who would be really excited about an In-N-Out opening are the people who really, really love it. If they opened one in Chicago, everyone would be excited for five minutes, because we don’t have them here. But in this case, only the people with the purest love for Double-Doubles and secret menus would be affected. That’s not punching up! That’s punching down. Second, the construction site in question is actually the future home of an Aldi, and how dare you disrespect Aldi like that. Third, this is the second time in recent months they’ve pulled this exact prank. I begrudgingly respect their desire to get as much use as possible out of the banner they paid to have printed. And I begrudgingly admit that doing this twice is funnier than doing it once, Charlie Brown and the football-style. But still. Cold. Fourth, if you’re assuming this is a coupla young hooligans out for a joyride and a few laughs, you are mistaken. This is the work of Geek Tech Team, which is not, as I previously thought, just a really strange name for a bunch of would-be YouTube stars. It is a business. A visit to their Facebook page reveals that they are understandably very pleased with the publicity they’re getting, and here I sit, typing about it, so well-played, I suppose. But, uh, what does this have to do with getting a new Lorex security system installed in my Porterville home, or upgrading my workstation to a solid state hard drive? 1. I bet Postmates would bring you some In-N-Out from Visalia.